A small theatre and en energetic crowd were the main ingredients for a really fun gig. We thought it’d be fun to add an explosion to one of Marty’s solos (it seemed appropriate in a song about thermodynamics). It was fun, but the chemistry wasn’t all that precise, so we weren’t sure when - or if - it would actually go off and how big it might be. After gathering bits of random footage, this video is less than three minutes, cut down from about 20. It was absolutely worth the wait. Every now and then we stumble upon a bit of live video that someone shot somewhere and it often brings back fond memories. 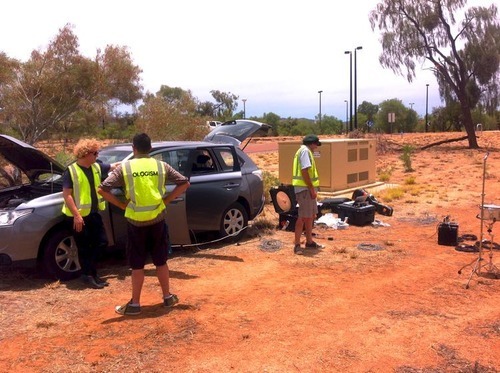 Here’s some ‘Nanotechnology’, live from Alice Springs. We’re home again after a great time touring Alice Springs. We were gone for less than a week, but the readjustment seems to have been steeper than expected. Maybe it was the weather or beautiful desert scenery, maybe it was great gigs, maybe it was just long enough to feel like a holiday. In any case the contrast to normality is undeniable. Perhaps this is not so surprising when the comparison between the normal and the not normal is marked. We walked on red earth, we observed black kites and thorny devils, we drank wine and listened to a duet in a pub. We bought aboriginal art, we let the sun warm our faces and burn our legs, we stood in the street and let to massive desert rain invigorate us with great, cold slaps of wet relief. We met a man with an orange bicycle and a Dachshund called Madeleine. 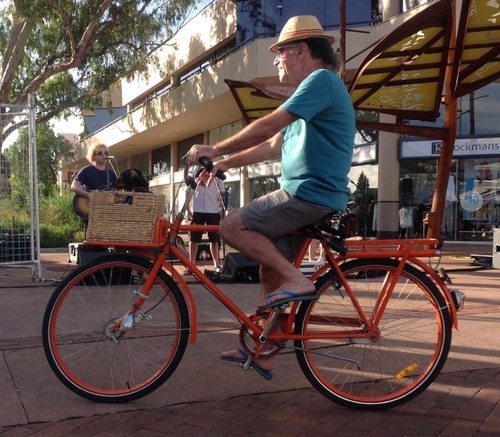 The tour included a gig in the Todd St Mall and gigs Centralian Senior College. We also did two web-streamed gigs, one from the Desert Knowledge Precinct and another from the Telegraph Station Reserve. We’re hoping to have a couple of videos uploaded soon that might go a very small way to capturing the fun we had. Ologism (or variations thereof) has been around for more than a decade. From a pretty vague thought exercise about doing some sort of science performance utilizing music, it has evolved into one of our favourite things. For the last three years we have been supported by an Inspiring Australia Unlocking Australia’s Potential (UAP) grant. We’re immensely grateful for this opportunity. It has taken us all over the country, from Sydney to Natimuk, Townsville to Adelaide, Burnie to Darwin. 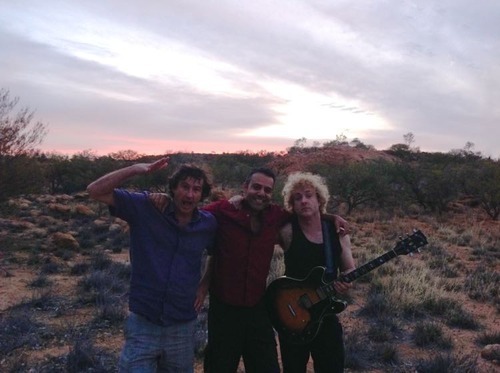 It helped us explore web streaming and develop more online content, but this trip to Alice Springs included our last live performances under the grant (probably). UAP might be over, but Ologism certainly isn’t. We’re always exploring live gig possibilities, so let us know if you know people who’d like to rock out with us. We will also continue to share things online, and we’re toying with other media as well. This is a new phase for Ologism, so don’t anywhere. Stay tuned for whatever happens next and stay in touch. Air Shower - new video! With rising population, water resources under increasing pressure and the ever pressing need not to stink too much, we invite you to join us for an ‘Air Shower’. Novocastrians unite - at the Wicko! 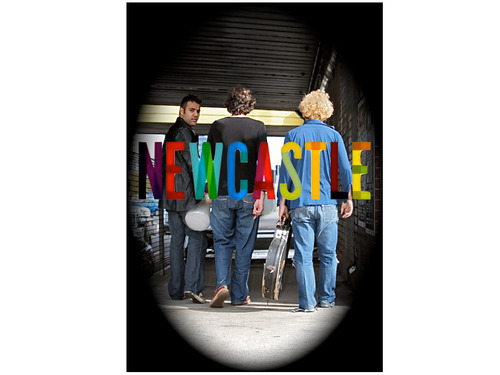 It has taken us far too long, but we’re coming to Newcastle, Australia’s 7th largest city and one of our great live music cities. We’re only in town for one show, but it is free. Come on down and help us rock the Wickham Park Hotel on Tuesday 21 October from 8pm.